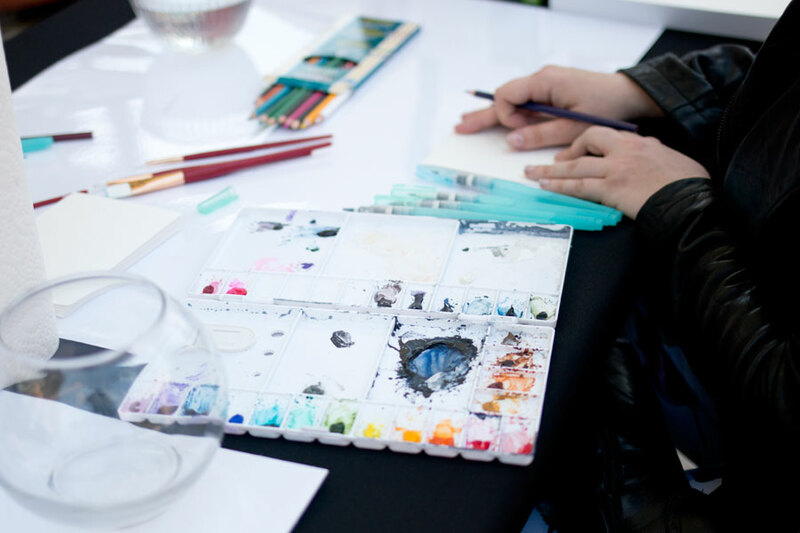 Product Discount/Sample: Discounts and samples were provided to me by Seattle Premium Outlets for attending this event. Affiliate Links: If you click a link below, I may make a very small commission. Am I the only one that procrastinates on purchasing gifts for their parents? Because the older I’ve gotten, the harder it has been to shop for them. (Sorry, Mom!) Really though, they have everything they need, and for the most part just buy things when they want to. Puts a lot of pressure on me to find just the right gift, so lately I’ve gone the boring route and suggested a dinner or lunch out. 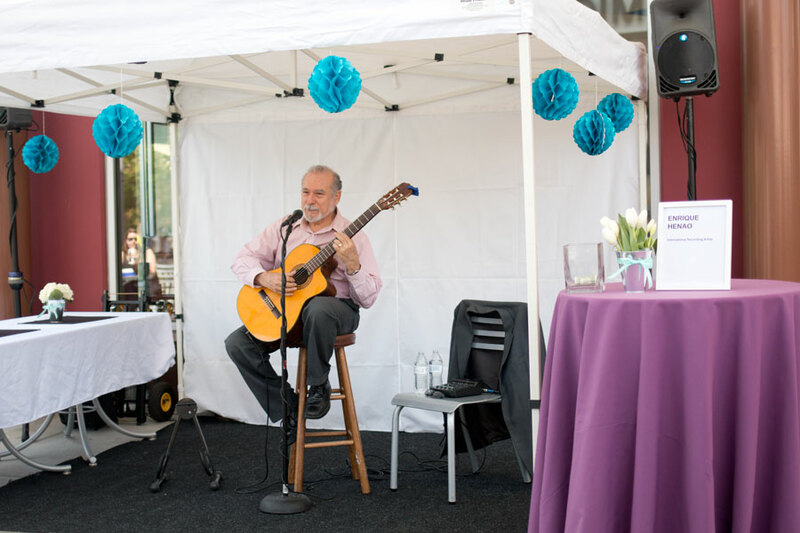 That only can happen so often, so I set off to the Seattle Premium Outlets this weekend to check out the Indulge Event and see what the outlets had to offer. I was pleasantly surprised; there were a lot of the stereotypical sets of lotions and skin care (which yes, I do like, but often is one of those gifts that my Mom doesn’t always) but a lot of unique ideas too. I think my favorite gift idea was this Cozy Wrap from DKNY. 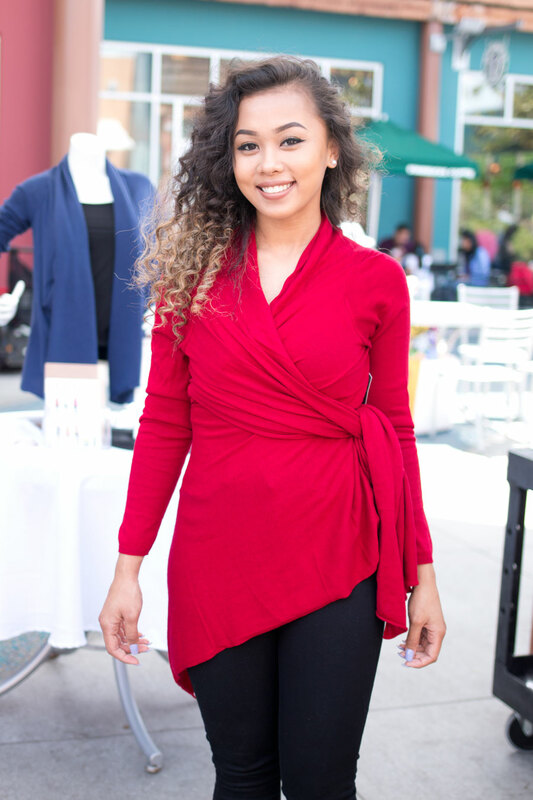 A couple reps from the store were out modeling at least ten different ways to wear one wrap sweater, and I was super impressed by it! Talk about functional. Between the live music, activities, and shopping to be had, my experience getting a little last minute shopping was a good one. But what did I find? And what can you run and grab at your local outlet before seeing Mom today? Read on for a few suggestions! Le Creuset Whistling Tea Kettle: I saw this at the Le Creuset Outlet Store and thought it was just the cutest thing! Unfortunately, my outlet didn’t have it in yellow (which is my Mom’s favorite color) but they had plenty of other great colors like Pink Chiffon! Bobbi Brown Makeup Palette: Bobbi Brown makes killer sets of neutrals. I think my Mom would love the simplicity of this one. If you’re at the Premium Outlets, don’t miss the Cosmetics Company Store, which has some crazy deals on high-end makeup. Dooney & Bourke Claremont Dover Tote: This was in the window at the Dooney & Bourke store, and it caught my eye. It comes in a ton of colors, but it’s also such a nice, classic tote that I think any Mom would love it. Dior Addict Perfume: My Mom’s favorite perfume is Dior Addict, and it’s a pricey one so it’s not something she would normally buy for herself. Loved being able to find on discount at the Fragrance Outlet! DKNY Long Sleeve Cozy: As pictured above, they were demonstrating how you can wrap this in a ton of different ways. Use it as a scarf, twist it in the front, wear it as a wrap sweater or a shawl. So crazy. I recommend buying this at the outlet; they were on sale 2 for $99. JJ Caprices Turquoise Drop Earrings: This is a local boutique (so no, not at the outlet) but I wanted to throw in a couple of great Seattle-specific finds too. She sells beautiful jewelry sourced from around the world. Tommy Hilfiger Seersucker Scarf: My Mom is a huge fan of scarves, and I love the classic look of this one. I think the seersucker lends some nice texture, and I love the colors. It would go with anything! Fran’s Chocolates Gift Sets: These super rich chocolates are handmade high quality and mostly organic ingredients. And they are dang delicious! If Mom is a caramel fan, their sea salt caramels are killer! Find these at Seattle-area Whole Foods and Fran’s boutique downtown. 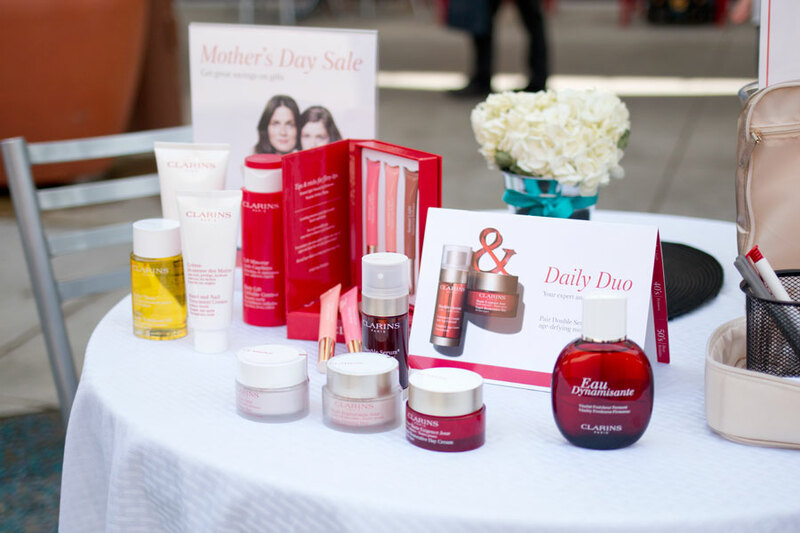 Clarins Pampering Favorites: I just got a sample set of Clarins products to try, and I’m so excited because I’ve heard nothing but good things. This set looks equally as awesome – I mean, who doesn’t want some body pampering?! L’Occitane Spring Into Summer Set: L’Occitane makes my absolute favorite hand cream, but it’s a little pricey on its own. Purchasing a set allows Mom to try more products at a price point that doesn’t seem as bad. BEVEE Convertible Clutch: If a tote bag isn’t your Mom’s speed, what about this convertible clutch? This local company has pioneered a new bag that is a wallet, crossbody, shoulder bag, and clutch all in one. Lesportsac Purse Organizer: For those that lug their whole life with them, this purse organizer looks like a dream! I love the fun contrasting stripes too. Crabtree & Evelyn Hand Therapy Set: This gift makes a statement. I love the scents of Crabtree & Evelyn, and as mentioned above, I love a good hand cream. This set was on sale at the outlets for $39, which seems pretty reasonable for the amount of product included. Sunglass Hut Ray-Ban Erika Sunglasses: And to end on a high (price) note, if you want to splurge on Mom, I love these Ray-Ban Erika frames! They’re super feminine but also a classic pair that will last for many years to come. 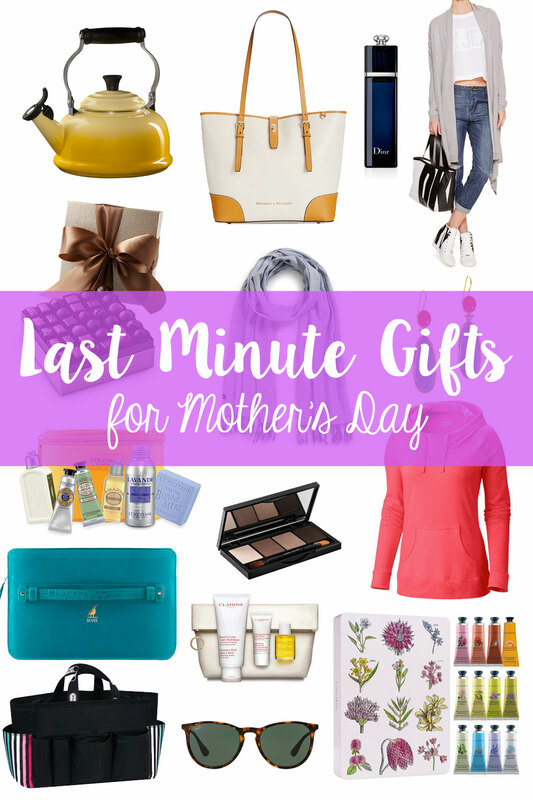 If you’re a last minute shopper, what are you getting for Mom? If you’ve already finished shopping, what did you get her this year? I know right? I just loved that color! I like Le Creuset Whistling Tea Kettle, miss the days when we used something like this more often. The Kettle is adorable, my mom and me would love to have it for sure. I know right? I rarely see tea kettles around anymore but they are so useful and very adorable! Tommy Hilfiger Seersucker Scarf is the best pick ever! It looks so marvelous! Thanks Mai, glad you like it! I so know what you mean about finding it hard to shop for parents. I seem to be giving my mum the same thing year on year and resorted to giving money as I do not know what to get most times. I am so loving that tote bag I want one. Isn’t that tote cute?! Yes, parents are so hard to shop for – I too give my mom basically the same year every year! What a great list of last minute gift ideas :) Thanks for sharing! That DKNY sweater is seriously so cute! I love anything super convertible and it looks so comfy – great guide!